Most common lesions here are thyroid lumps and thyroglossal lesions. Thyroid lumps are discussed in a separate section on this website. Thyroglossal lesions (cysts and tracts) are derived from the thyroglossal duct which occurs in embroyonic development but may persist and present as a lump or an opening most commonly in early life. In the development of the embryo the thyroid tissue grows in common with the tongue and then descends down into the neck by around 7 weeks of gestation. Part or all of the thyroid may not fully descend and in later life this may present as a lump or opening. 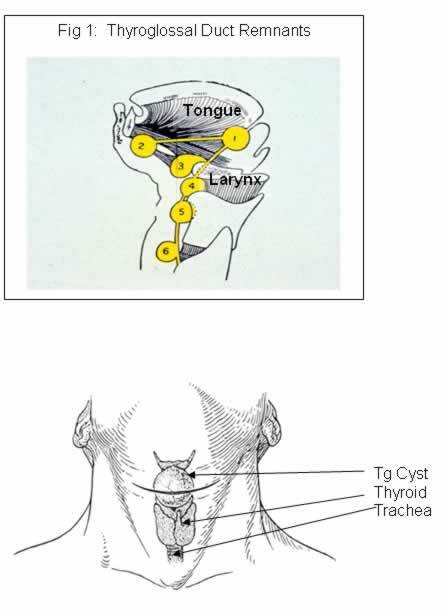 In the figure below 1. is a lingual thyroid (thyroid sitting in the tongue). 2-6 are various levels of thyroglossal cyst. Lymph Node masses and other types of cysts can also occur in the central compartment. Lateral neck masses most commonly present in association with the carotid artery or jugular vein as well as in the posterior triangle. Solid lesions in the lateral neck are either enlarged nodes (inflammatory or malignant). Or they are rare tumours such as tumours of the carotid artery or vagus nerve. Cystic lesions also occur in the lateral neck, in particular branchial cysts (persisting remnant of the gill system present in embryos), along with lymph cysts. Malignant nodes can also under go cystic changes. Nodal lesions in the posterior triangle and supraclavicular are common. These may be inflammatory; e.g. in response to toxoplasmosis, but malignant nodes may occur for example secondary to skin cancers of the scalp and neck. 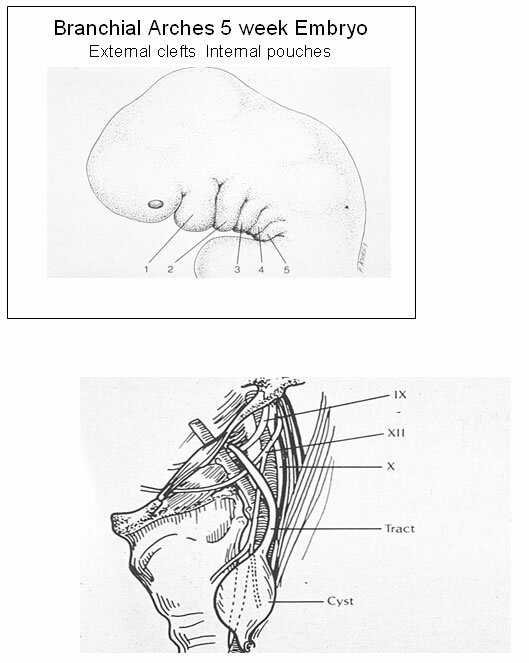 The branchial system is shown in the figure below. Only clefts 1 & 2 are clinically relavent. Note tract goes between internal & external carotid arteries and close to cranial nerves IX, X, XII which control amoung other functions tingue movement and swallowing. Lumps in the submandibular area are usually related to the submandibular gland (one of the 3 major salivary glands). Obstruction of the duct by a stone typically presents as painful swelling associated with eating. Sometimes the stone can be felt in the duct in the floor of the mouth or demonstrated on a plain X-ray. Submandibular salivary tumours present as swellings, 50% of which are cancers. Inflammatory lymph nodes may occur in response to an inflammatory process in the mouth while lymph node metastases to this area are either from lip or anterior facial skin cancers or from tumours in the mouth. Ranula, a cystic swelling in the floor of the mouth caused by a mucous cyst of the sublingual gland may present as a swelling in the submandibular region. See also Salivary gland section of this website. Parotid swellings that occur in this area are usually benign tumours or occasionally inflammatory masses due to duct obstruction. The most common cancer in this area is due to a skin cancer (either SCC or melanoma). Spreading to involve lymph nodes in the parotid glands. These are discussed in the Salivary gland section. Rarely tumours may develop in the wall of the carotid artery and present as a slowly growing lateral neck lump most commonly during middle age. These are known as carotid body tumours and the key clinical feature is the presence of a “pulsatile” lesion, and this is one neck lump where there is at least a relative contra-indication for the performance of a FNA biopsy. If a carotid body tumour is suspected an ultrasound scan is a useful initial investigation and if the diagnosis seems likely, an Magnetic Resonance scan (MRI) coupled with an arteriogram (MRI arteriogram) is usually diagnostic. Surgical resection is required and this is usually technically difficult and the surgery lengthy. There are approximately on of these tumours per year in Auckland and the author has personally operated on 15 patients with this problem aged between 16 and 60 years. There is a small risk of stroke during this type of surgery (0% to date in the author’s experience) but the main risk is to cranial nerves close to the carotid artery which control swallowing, move the tongue, and move the muscles of the face. These nerve injuries are usually temporary. 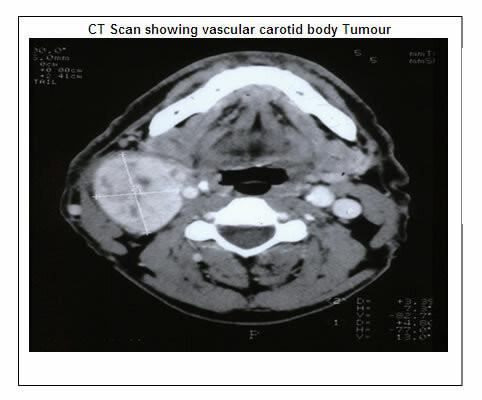 The figures below show a CT scan of a carotid body tumour, an arteriogram showing a carotid body tumour with a rich blood supply, and lastly the surgical approach used to resect such lesions. 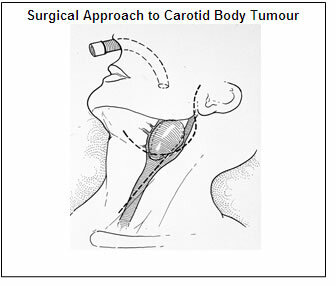 Resection of a carotid body tumour is a major operative procedure which takes several hours to perform. General anaesthesia is required with a nasal rather than on oral airway (see below). 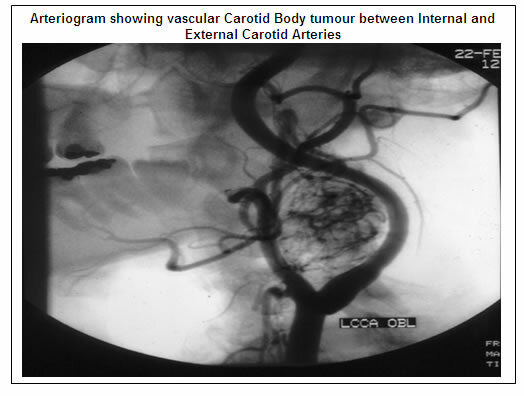 The common carotid artery and the two main branches ( the internal and external carotid arteries) are mobilized and controlled and the tumour is carefully mobilized and then resected after taking its blood supply. Sometimes part of the external carotid artery must be resected, and rarely the internal carotid artery requires resection and replacement with a vein graft.